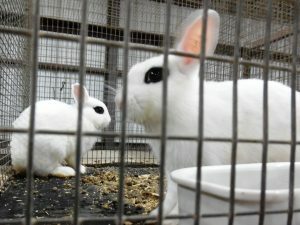 FFA classroom activities include math and science as well as hands-on work experience and the development of life skills. 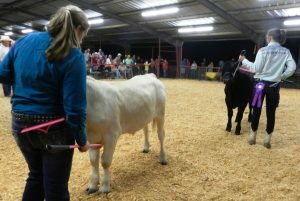 FFA members earn more than $4 billion annually through their hands-on work experience, learning advanced career skills in 49 national proficiency areas ranging from agricultural communications and food science and technology to turf grass management and wildlife production and management. FFA members are challenged to real-life, hands-on tests of skills used to prepare them for more than 200 careers in agriculture. Learn more about the Future Farmers of America at www.ffa.org Kudos to all the young folks involved in FFA, eager to learn and proud to show off their skills and successes. 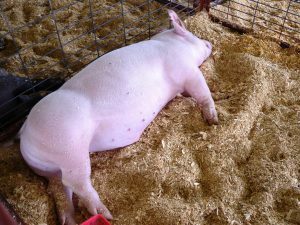 Now I will do a little bragging about myself from this year’s Clark County Fair. I too did a little showing off, and a little winning. 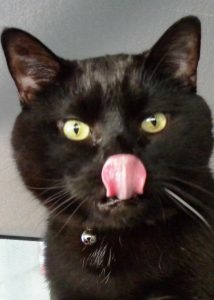 A photography contest for pets! No, I could not resist. How many photos do I have of my cats? Alex and Jack live on in memory and in thousands of pixels, PLUS I have a brand new kitty, just come to live with me. 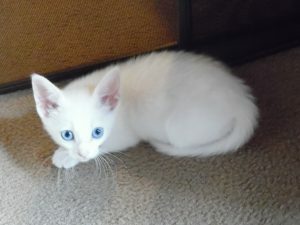 I named her Katy, she is solid white with blue eyes, and weighed 1.5 pounds when I retrieved her from under a bush by an office building. She was abandoned by her mother, I was told; she hid under thick branches and peeped out only when they set out food for her. I took her straight to the vet; we got rid of the fleas and started her health care immediately. She has grown six inches in length and tripled her weight since that day, but I share her original photo, taken the first day I brought her home. I entered her photo in the contest, as well as old photos of Alex and Jack. Jack’s famous “One White Whisker” photo already used on this site won a Second Place ribbon in the “Coolest Cat” category. 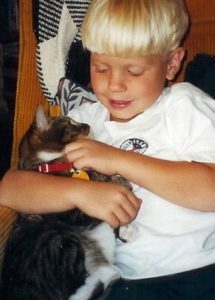 And the photo I took of Grandson Justin and new-in-the-household Alex Cat getting acquainted in 1998 won a Third Place ribbon in the “Pet and Child” category. 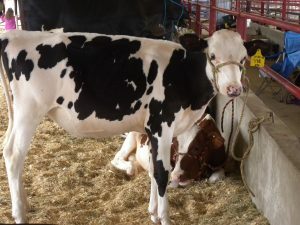 Katy’s photo didn’t win a prize, but I got to “show her off” to hundreds of people (as proud as those FFA young folks showing off their show-worthy goats). 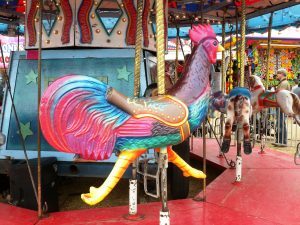 Here are a few other favorite scenes from the Clark County Fair, held every year in September; a real “community party” in the very best sense of the word. 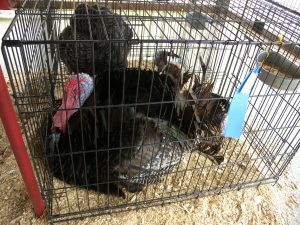 The County Fair gives us a chance to share our own accomplishments and to “ooh and ahh” over what other folks are doing. 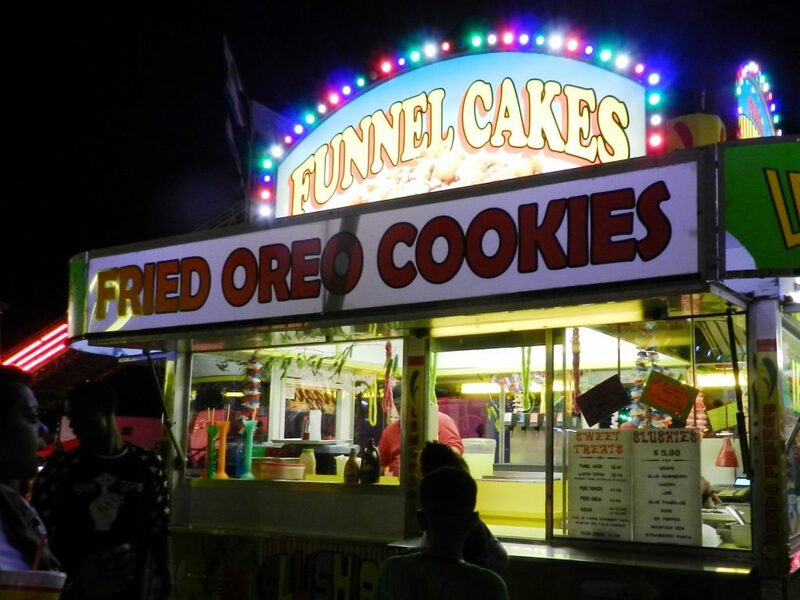 And to indulge in a hot fried funnel cake. Once a year is okay.